As part of its push to ensure access to safe and aflatoxin-free food across Africa, IITA recently trained stakeholders in the governments’ agricultural extension services in parts of Tanzania, on aflatoxin and on use of aflasafeTZ, the effective biocontrol product that reduces aflatoxin contamination consistently by more than 80% to safe levels. Some of the participants at the Aflasafe trial fields where they were taught the practical application of the technology in the field. Aflatoxin, a deadly chemical poison that can cause stunting in children, liver cancer, and even death in cases of severe poisoning, is produced by the greenish mold, Aspergillus flavus, which is commonly found in soils. Aflatoxin contamination of major staple commodities including maize, groundnuts, and sorghum, and its negative impact on agriculture, trade, human and animal health is a major concern in Tanzania. In 2016, cases of acute aflatoxin poisoning that caused death were reported in three districts. Studies also conducted in Morogoro district showed that aflatoxins are major contributors to the high stunting rate of 42% in the region. More than 99% of children who participated in the study were also found to have aflatoxin in their blood and urine, indicating chronic exposure to aflatoxins. The innovative AflasafeTZ technology is also made with strains of A. flavus which do not produce aflatoxin but are instead able to displace those that do. AflasafeTZ was developed with A. flavus strains collected in Tanzania and is a result of collaboration between IITA, the U.S. Department of Agriculture-Agricultural Research Services (USDA-ARS), and the Tanzania Ministry of Agriculture with financial support from United States Agency for International Development (USAID). “Now that aflasafeTZ01 has been approved for registration we are preparing the country to receive and apply the technology by creating awareness. The product is safe. It is already in use in Nigeria, Kenya, Senegal, and The Gambia. 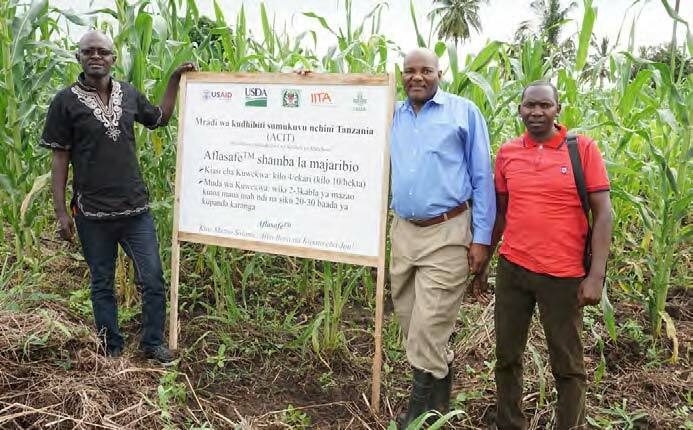 We are excited that it will soon be available to smallholder farmers in Tanzania,” said George Mahuku, IITA Plant Pathologist based in Tanzania, who led the training. The training took place 14-15 May, in Kilosa, Morogoro, Tanzania, and brought together 37 participants drawn from Morogoro, Manyara, Dodoma, and Singida regions. The objectives of the training were to update stakeholders on the progress made in the development and registration of AflasafeTZ; review strategies for creating awareness; and develop a road map for scaling out the product across the country for aflatoxin prevention. Despite its threat to health, more than 75% of the people in Tanzania are not aware of aflatoxins and their health effects and continue to unknowingly put their lives and those of their families at risk from consumption of contaminated products. IITA has therefore been conducting a lot of awareness creation exercises to reverse this situation. The participants are expected to go back to their districts and disseminate information to farmers and other stakeholders along the maize and groundnut value chains.